With a digital SLR camera, like your Canon EOS Rebel T3/1100D, you can swap lenses to suit different photographic needs, going from an extreme close-up lens to a super-long telephoto, for example. Additionally, an SLR lens has a movable focusing ring that allows you to focus manually instead of relying on the camera’s autofocus mechanism. Even this basic difference extends your picture-making opportunities in big ways. Your camera accepts two categories of Canon lenses: those with an EF-S design and those with a plain-old EF design. The EF stands for electro focus; the S, for short back focus. And that simply means the rear element of the lens is closer to the sensor than with an EF lens. Just make sure that if you buy a Canon lens other than the one sold with the camera, it carries either the EF or EF-S specification. The Rebel 1100D is compatible with both new types of Canon lenses, whereas EF-compatible cameras can only fit the EF type lenses. If you want to buy a non-Canon lens, check the lens manufacturer’s website to find out which lenses work with the Rebel 1100D. If you don’t already have a lens attached, remove the cap that covers the lens mount on the front of the camera. You’ll be in this situation the first time you take the camera out of its box, and if you like putting the body cap back on when you’re done shooting. If there’s already a lens attached, you’ll have to remove it rather than this cap (see the next series of steps) to put another one on. Remove the cap that covers the back of the lens. Locate the proper lens mounting index on the camera body. 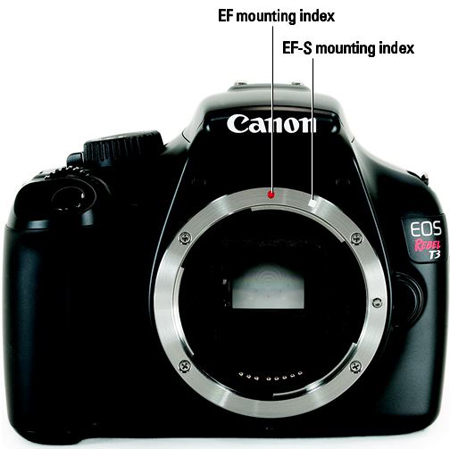 A mounting index is simply a marker that tells you where to align the lens with the camera body when connecting the two. Your camera has two of these markers — one red and one white — as shown in the following figure. Canon EF-S lens: The white square is the mounting index. 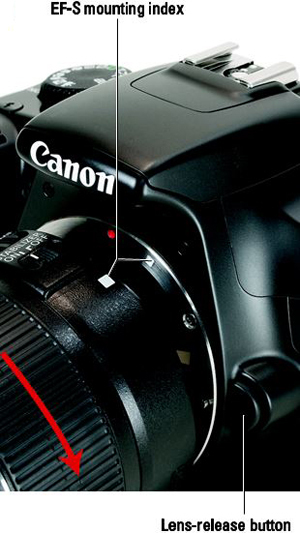 Canon EF lens: The red dot is the mounting index. Which index marker you should use depends on the lens type. For a non-Canon lens, check the lens manual for help with this step. Align the mounting index on the lens with the correct one on the camera body. The lens also has a mounting index. The following figure shows the one that appears on the so-called kit lens — the EF-S 18–55mm IS (Image Stabilizer) zoom lens that Canon sells as a unit with the Rebel 1100D. If you buy a different lens, the index marker may be red or some other color, so again, check the lens instruction manual. Place the lens in the lens mount with the mounting indexes aligned. Keeping the mounting indexes aligned, position the lens on the camera’s lens mount. Turn the lens in a clockwise direction until the lens clicks into place. In other words, turn the lens toward the lens-release button, as indicated in the preceding figure. Always attach (or switch) lenses in a clean environment to reduce the risk of getting dust, dirt, and other contaminants inside the camera or lens. Changing lenses on the beach on a windy day, for example, isn’t a good idea. For added safety, point the camera body slightly down when performing this maneuver. Doing so helps prevent any flotsam in the air from being drawn into the camera by gravity. Locate the lens-release button on the front of the camera, labeled in the preceding figure. Grip the rear collar of the lens. In other words, hold onto the stationary part of the lens that’s closest to the camera body. Press the lens-release button while turning the lens away from the lens-release button (counterclockwise). You can feel the lens release from the mount at this point. Lift the lens off the mount to remove it. Place the rear protective cap onto the back of the lens. If you aren’t putting another lens on the camera, cover the lens mount with the protective cap that came with your camera, too. These steps help keep your lens and camera interior dust-free.